Ultrasonic Soldering Machine ( Dip Soldering Type ) offers highly solid and reliable soldering joints without flux. eliminating wicking is that the solder coating on the base material can be better controlled. Ultrasonic energy introduced into a dip solder pot eliminates the need for flux while enhancing many soldering processes. It also provides a means to bond solder to a number of materials including aluminum and glass that are difficult or impossible to solder using conventional soldering techniques. 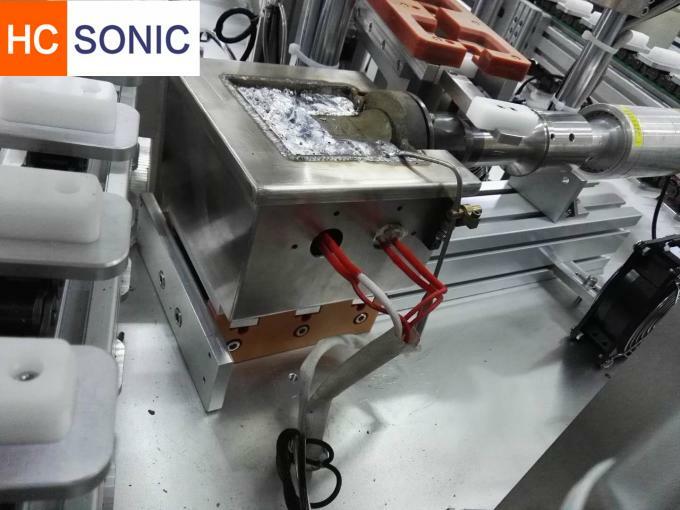 HC-sonic has perfected a technique for introducing ultrasonic energy into dip solder pots and is the exclusive manufacturer of this type of equipment in the world today. HC-SONIC' solder pots are activated by externally mounted transducers which allow large volume multi-part dipping. The systems' controls are adaptable to automated lines. A process for tinning plated wire involves first the placing of the wire in a suitable chemical flux for a period of time, the wire is then immersed for a period of time into a static solder pot having molten solder therein, the wire is then re-immersed into the chemical flux for a period of time, and finally the wire is immersed for a period of time into an ultrasonic solder pot having molten solder therein, the wire when removed from the ultrasonic pot being sufficiently tinned such that the solder has formed a suitable intermolecular bond to the plating in accordance with typical bonding criteria. Component lead solderability is a major consideration when devices are to be incorporated into high reliability hardware such as that used by the military, human implants including pacemakers and defibrillators, and for aerospace applications. This is especially true in cases where the device, once installed, is not accessible for service. In these critical applications it is commonplace to "tin" component leads when they arrive at the assembly house and prior to going into storage. In some cases the component leads may again be "tinned" immediately prior to use. Ultrasonic tinning offers several advantages over conventional flux methods for high reliability lead tinning. The ultrasonic soldering process does not use flux. Ultrasonic cavitation and implosion provide the mechanism to mechanically remove surface oxides to allow solder adhesion to take place. Since there is no flux used, there is no chance of solder splatter or the inclusion of flux or flux decomposition byproducts in the solder coating. 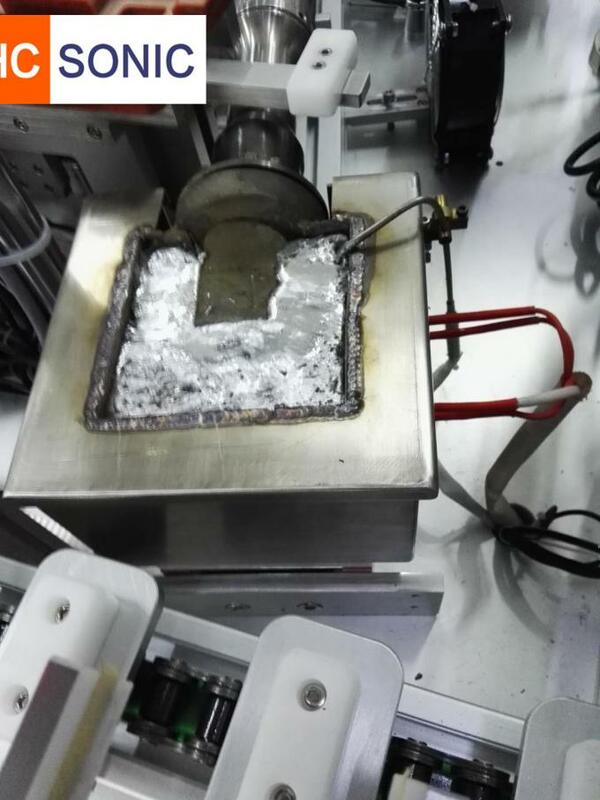 The necessity to remove flux residues after soldering is also eliminated. Since there is no flux, there is no "wicking" of solder above the solder level. This means that solder will not wick into stranded wires or into connector contacts. The ultrasonic soldering process excels in the removal of protective gold, silver, and other platings from lead surfaces. Military and NASA specifications recommend ultrasonic soldering for gold removal. 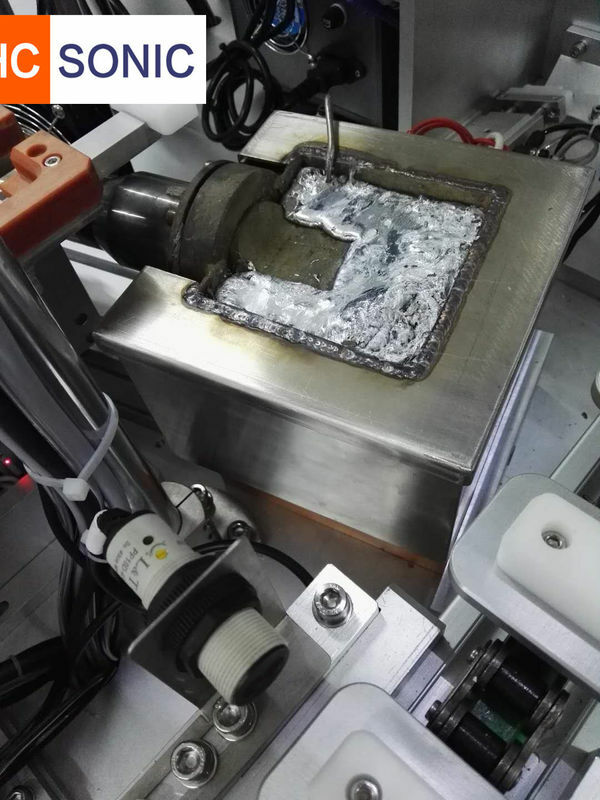 Ultrasonic tinning has been successful in restoring the solderability of component leads that could not be recovered using the fluxes allowed by military and other specifications. The vigorous mechanical scrubbing provided by ultrasonic energy surpasses many other mechanical recovery techniques.